When his younger brother loses interest in online dating, hot, bearded, bartender extraordinaire, Joe Collins, only intends to log into his brother’s account and shut it down. Until he reads about her – Alex. Alex Parks is funny, friendly, and pretty much everything he’s been looking for in a woman. And in no time at all they’re emailing up a storm, telling each other their deepest darkest secrets . . . apart from the one that really matters. 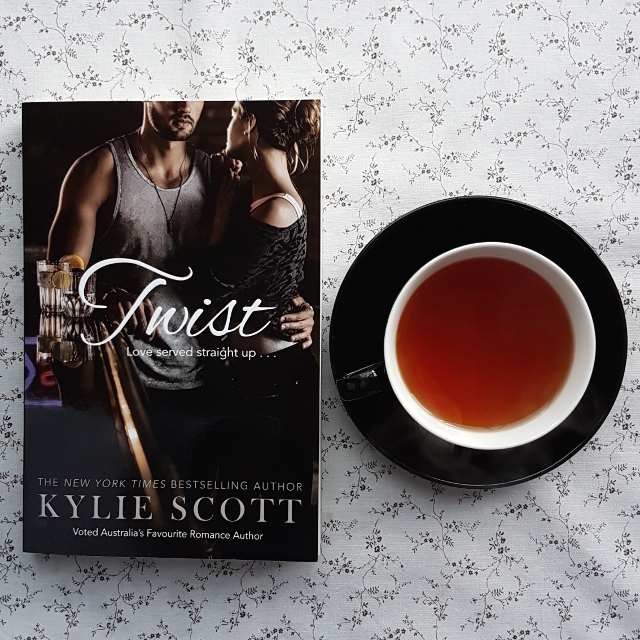 Kylie Scott shows why she’s one of Australia’s most beloved romance writers with her new book Twist. It’s the second book in the Dive Bar series but, as with most romance, it’s not necessary to have read the previous book to enjoy this one. The start is compelling. Alex has flown into town and shows up at the Dive Bar in her little black dress and towering heels, looking to crash Joe’s birthday party. It’s an uncharacteristic move for her, but she was goaded into it by her best friend and she’s been trading emails with Joe for months via a dating site. Except Joe has been using his brother’s account. So, when Alex throws herself at Eric, thinking he’s the man she’s been emailing, chaos ensues. I have a bit of a humiliation squick, so the opening was hard going for me. It read like a nightmare that I kept expecting Alex to wake from. However, I thought she handled herself pretty well, and wanting to find out what happens to her helped me push through the discomfort. Joe is used to women passing him by in favour of his brother. It’s not that he’s unattractive–being broad, bearded and blond–but women like their bad boys and that’s just not him. Joe’s family and friends mean a lot to him and he bends over backwards trying to please everyone. But although he loves them, his friends and family drive him nuts sometimes. His emails to Alex were a place he could safely vent. Joe treats everyone with painstaking respect, making the times he crosses boundaries all the more jarring. However, one of the things I enjoyed most about his character is that he readily admits when he’s done something wrong. The story is told in first person solely from Alex’s perspective. Nevertheless, it manages to do an excellent job of conveying Joe’s feelings. This is partly helped by the inclusion of some of their emails at the start of each chapter, but mostly the result of Joe’s earnestness and some excellent storytelling. A couple of the plot twists felt a little forced, but it is difficult to say more without spoilers. The ending also featured a cameo by characters from Scott’s previous series. As a new reader, I found this a bit disorientating and I briefly wondered whether I’d stumbled into a preview for another book. However, despite these flaws, I found it to be an entertaining and down-to-earth read. Twist is my first foray into Scott’s work and I’ll definitely be seeking out more. Oh goody, I will have to try this! I haven’t read many (any?) Australian romance authors, so I love that you’re doing this whole reading series (and including romance novels in it). Adding to the TBR! If you’re looking for more Australian romance authors, I do a monthly round-up of reviews of the genre for the Australian Women Writers reading challenge. It’s a great place to find new authors.